The afternoon kicked off with RAMP Executive Vice President John Petrack welcoming guests and honorees. Incoming President Arch Autenreith invited longtime family friend and REALTOR® Emeritus, Nancy Mathews, to deliver our invocation. PA Association of REALTORS President Bill McFalls performed the formal installation of our new officers, (including President-Elect Robert Moncavage and Secretary-Treasurer Micole Tucker.) New RAMP President Arch Autenreith addressed the audience by telling the story of being a child and embarking on a two-year family trip sailing around the world. His father, the late Hal Autenreith, was a prominent REALTOR® who had planned for several years to take the family on this adventure. Arch recalled the days of beautiful blue skies, and those days that brought cloudy skies and stormy waters. He compared those contrasting conditions to that of the real estate business. Anybody in this business experiences the great times of many deals closing on time. However, there are the times where the market may not be so good and everything looks bleak. You strive to weather those storms so you can enjoy the good times. Mr. Autenreith's theme for the year borrows the nautical term, "Steady as She Goes." We may be experiencing blue skies now. But, we must be cautiously prepared for the turbulent seas that will inevitably arrive over time. Bette Zrimsek is the broker of record of RE/MAX South, Inc. in the South Hills of Pittsburgh. Licensed in 1976, she has been a member of RAMP since 1977. Bette earned her associate brokers license in 1979 and co-founded the RE/MAX South office in 1980. She served on many committees, most notably, the Professional Standards and Arbitration Committee. Ms. Zrimsek also served on the RAMP board of Directors. Her office is the longest active operating RE/MAX office in western Pennsylvania. We honor Bette's leadership and perseverance with the Lifetime Achievement Award. Distinguished Service Award - VINCENT J. GROGAN, ESQ. For over four decades, Vince Grogan has served as the legal counsel for the REALTORS® Association of Metropolitan Pittsburgh. Mr. Grogan's astute legal sense watched over the Association and kept us out of the courtroom. We have been served well by Vince and wish him all the best in his retirement. John Petrack introduced our 2018 Community Service Award winner with the following was described by this phrase: "Volunteers don't have more time, they have more heart." It seems no matter what we ask of Michelle Schocker, she steps up and gets it done. The Association undertakes many charitable and community service projects each year. It is a good bet that you are going to see Michelle (and sometimes she brings along her husband, Pete) there with a smile and upbeat attitude. Members like Michelle Schocker are an inspiration to all of us. Each year, the president of the Association has an opportunity to honor someone who influenced or had an impact on their year as president. 2018 President David Dean has a passion for our advocacy efforts and fundraising for the REALTORS Political Action Committee. That emphasis meant David spent many hours each week seated in a corner office of our building in front of our own Government Affairs Director, Matt Vermeire. For that reason, Matt is this year's recipient of the President's Award. Among the tasks David charged to Matt was the wildly successful RPAC fundraiser, Drag Bingo: Queens or Better. Matt has diligently monitored local legislation that affects your business and stays on top of the issues. His relationships with local lawmakers and politicians aid our goal to protect the American dream and our industry. This award is named after a gentleman who lived and breathed politics, Richard Stampahar. Richard was a Past President of RAMP and very active politically. Most notably, he was at one time the Chairman for the Allegheny County Republican Committee. His famous saying among his peers: "If real estate is your profession, politics is your business." So, when a member is the recipient of this award, it is no small feat. As we got to know 2019 President Arch Autenreith, we were fortunate enough to get to know more about his wife Erin. Erin's family involvement in politics is multi-generational. Her mother was a consistent county poll worker. Her father was mayor of McKees Rocks. And, Erin was a candidate for the State House and worked on several campaign committees. To this day, Mrs. Autenreith hosts a variety of political fundraisers. Erin Autenreith is a very deserving recipient for this award. Our Affiliate of the Year is Miranda Gula, of HSA Home Warranty. Miranda has been very active in the real estate industry, creating relationships with consumers and REALTORS. Throughout the year, the Affilaite Committee presents many different events with REALTORS and Miranda is usually one of the members that lends a helping hand. 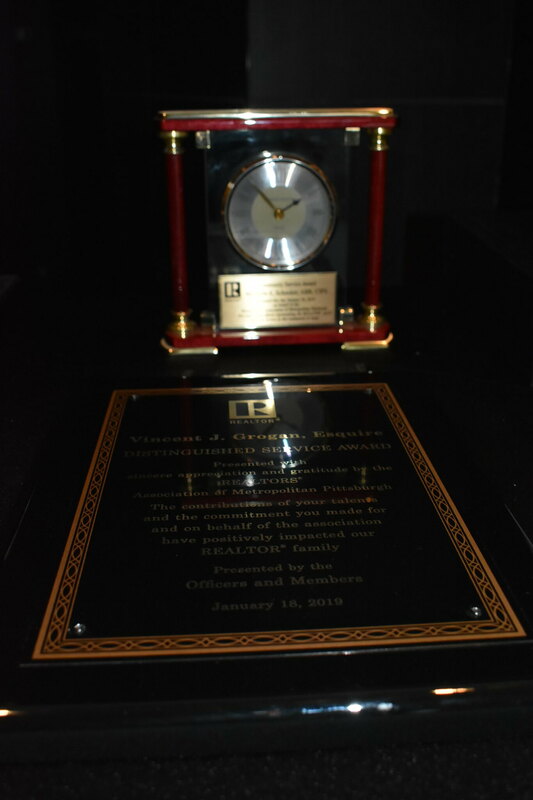 How much more can you do when you have served on all three levels of the REALTORS Association? Committee member, committee chair, RAMP Foundation president, Board of Directors, Secretary-Treasurer, President-Elect and ultimately President. Today, Nancy still serves on local committees and at the state level traveling to Harrisburg a few times a year. Currently, she is the chair of the RAMP Professional Standards and Arbitration Committee. We appreciate the knowledge, experience, energy, and service that Nancy gives back to her industry.